Fresh, frenetic and self-deprecating to a fault, Don's willingness to admit his flaws and exploit them for maximum comedic potential has a way of not only entertaining, but at the same time tapping into the humanity in all of us. Outrageously physical, yet thoroughly relatable, Friesen - whose act has earned him rave reviews and diehard fans across the country - serves up a uniquely fun, clever and clean comic act with an incredible broad appeal in this concert DVD. THIS MAY, A 2-TIME SAN FRANCISCO INTERNATIONAL COMEDY COMPETITION WINNER DELIVERS HIS UNIQUE BRAND OF OUTRAGEOUS COMEDY TO A PACKED HOUSE! 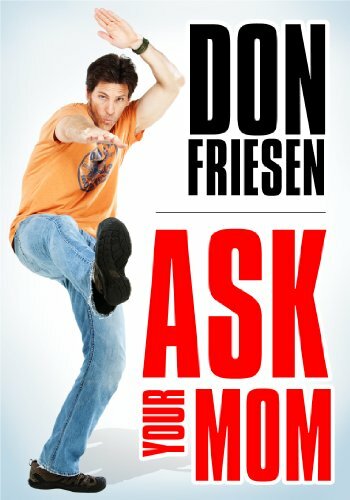 Don Friesen delivers the laughs in a big way in his brand new stand-up special Don Friesen: Ask Your Mom . Fresh, frenetic and self-deprecating to a fault, Don's willingness to admit his flaws and exploit them for maximum comedic potential has a way of not only entertaining, but at the same time tapping into the humanity in all of us. Outrageously physical, yet thoroughly relatable, Friesen - whose act has earned him rave reviews and diehard fans across the country - serves up a uniquely fun, clever and clean comic act with an incredible broad appeal in this concert DVD from the performer Martin Short calls "one of the fastest rising comics in show business today".